Media and news organizations usually publish press releases exactly as submitted. 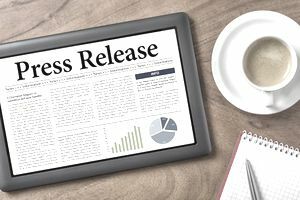 For that reason, creating a press release involves presenting information in a journalistic style that they can publish with little additional effort, along with contact information for follow-up. If you don't know how to create a press release, you can easily learn how to do so by following the guidelines and example below. Overall, you should keep a press release to one page (usually about 500 words). When you're done writing a press release, have someone check it for grammar mistakes, typos, and other errors. Also be sure to double check all links, facts, statistics, data, and contact information before you publish your press release. The company logo or related brand or event imagery should be displayed at the top of the press release. Your headline should be in initial caps. Be creative and compelling but succinct, and do not use all uppercase letters or punctuation—especially exclamation marks. You can use sub-headline next, although it's not necessary. If you use one, it should be catchy and informative, explain or quote something, and be written as a brief sentence. A sub-headline should not repeat information that's already in the headline. Press releases should be at least three paragraphs long, including the opening paragraph, supporting paragraph(s), and a closing paragraph that restates or summarizes your main points. Your opening sentence should be clear and strong. The first paragraph should contain the most important information and entice readers to want to continue reading the story. However, the first paragraph should also contain enough information that it could stand on its own. Typically, the opening paragraph offers information about who, what, where, when, why, and how. The second and subsequent paragraphs make up the body of the press release and should contain more detailed information. The body often contains quotes from others (customers, clients, staff, peers, donors, or industry experts) to support your message. Just below the last paragraph of the release, include a short, positive statement about your company. This is a promotional sound bite that often contains a website address, the size and scope of business, its tagline, or other relevant information. Close the entire press release with contact information and a series of three pound signs (as shown below) to indicate the end of the press release. BOULDER, Colo., June 5, 2018— Join Startup Colorado and the local entrepreneurial community on Tuesday, June 12, at 5 p.m. for a party to celebrate up-and-coming startup talent and kick off Startup Summer 2018. Startup Summer 2018 will bring promising entrepreneurial students from Colorado and across the country to work at Colorado startups in Boulder, Denver, and Colorado Springs. The kickoff party will feature food, drinks, and a discussion with Nancy Phillips, President and CEO of ViaWest, and Erik Mitisek, CEO of the Colorado Technology Association. Register at Eventbrite to join the celebration. AMG National Trust Bank will host the class of Startup Summer 2018, as well as the entrepreneurial community, at its new headquarters in Greenwood Village. Student participants will receive real-world startup experience, as well as unmatched education and access to local entrepreneurial leaders. Founded in 2011, Startup Colorado is an initiative to increase the breadth and depth of the entrepreneurial ecosystem across Colorado's Front Range. From Fort Collins to Boulder and Denver to Colorado Springs, our mission is to multiply connections among entrepreneurs and mentors, improve access to entrepreneurial education, and build a more vibrant entrepreneurial community. For more information visit www.startupcolorado.org. Unhappy Customer? Here Is How to Handle a Customer's Complaint.